I had absolutely no inspiration for a post today, hence it was going to be one of those 'no-post' days. But then something fabulous happened! A stranger left a comment on my blog, I went to check out her own blog and came across her fabulous work. Then later in the day she send me a short & sweet email, which totally made my day. No wait, totally made my whole month! sally and holly frm Hippie By Heart. Thinks Fashion Is Art! How sweet is that? Who does that? Well, no one I know is this sweet to strangers. Thank you sooooooo much, Aarti. You are so talented and very sweet! I look so much more stylish and chic in your interpretation. And that nose ring is a fabulous touch and an artist's observation. I love it. Everyone, please, do go and check out her work at Art meets Fashion. These are soooo cute! Looks like Aarti is one talented gal! are the things you do not expect those that give you more joy! You should post a photo of the outfit she used as inspiration for the drawing! That is too cute! So serendipitous! XO! Will check it out. And I know what you mean about the posts-sometimes we either get too busy or the inspiration is just not there. Happy Wednesday Tanvi. Hope you and hubby are feeling better. How sweet of her. Nice to have a sketch of yourself. That is such a fun, cute and sweet illustration. It's people like Aarti that bring hope that the world is not restricted to the ones around you and you should not get dissuaded when people around are not as friendly. There are (more) people out there who are simply sweet. How sweet!!! She's very talented. What a talented artist Aarti is! These could be sold! since you just finished doing a wedding post, here's a beautiful link for you...enjoy! It's so sweet. That's honestly why I love blogging. People are just so nice and supportive!!!! awwww dat was really sweet!!! n did u notice d nose ring in this pic?? She is so talented,generous in admiration,observatory and too sweet.Loved it totally. Awww, that's really sweet of her. It looks really great. Aw, so cute! I'd be so excited to see an illustration of myself. I can see why it made your month. OMG that's the sweetest thing ever! What a great girl! Gotta go check her out. wow that is impressive! 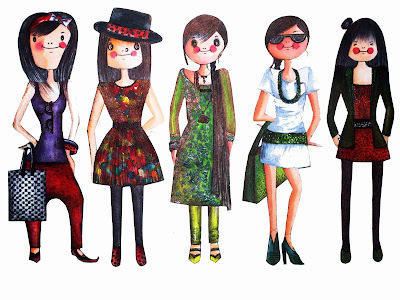 How sweet is she..will check her blog out..
Really great story, and such a cute illustration! Will have to check out her site too!